I’ve never felt closer to Tina Fey. In just a few short days I’ll watch her make sweet, comedy magic with Amy Poehler on the Golden Globes. Tina Fey’s alter-ego, Liz Lemon would most definitely load up on pizza, cheese, and chicken fingers while enjoying the show, but I have something a bit more refined in mind (and equally delicious). This sweet and savory bruschetta is the best kind of recipe because all it requires is assembly. It’s so easy I dare say even Liz Lemon would attempt it. Turn the oven to broil. Brush each slice of bread with olive oil–on both sides. Place them on a cookie sheet and under the hot broiler for one minute or until brown. Do the same with the other side, making sure to keep a careful eye on them, so they don’t burn. Directly out of the oven, choose a toasted side of bread and rub the garlic clove all over it. You may or may not need the second clove. 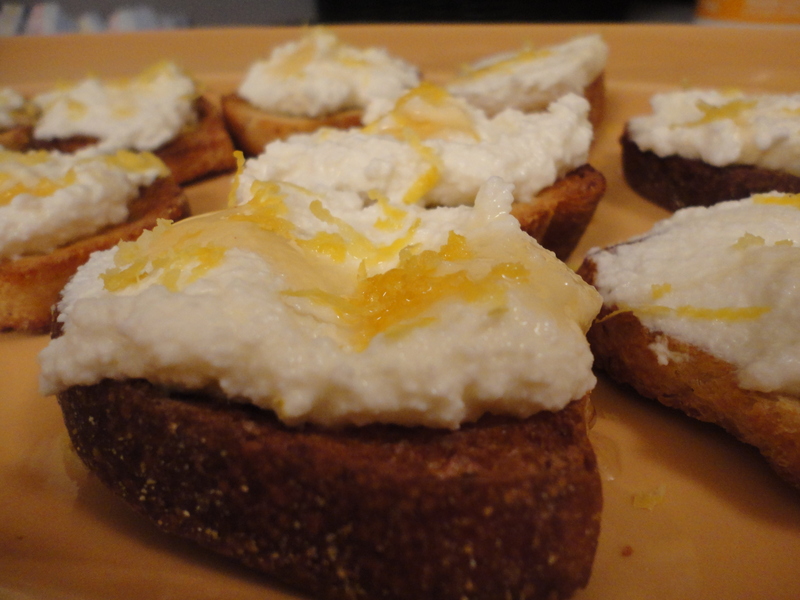 Place about a tablespoon’s worth of the ricotta onto each garlic-rubbed side of the bread. Follow that with a sprinkling of kosher salt, then drizzle generously with honey. 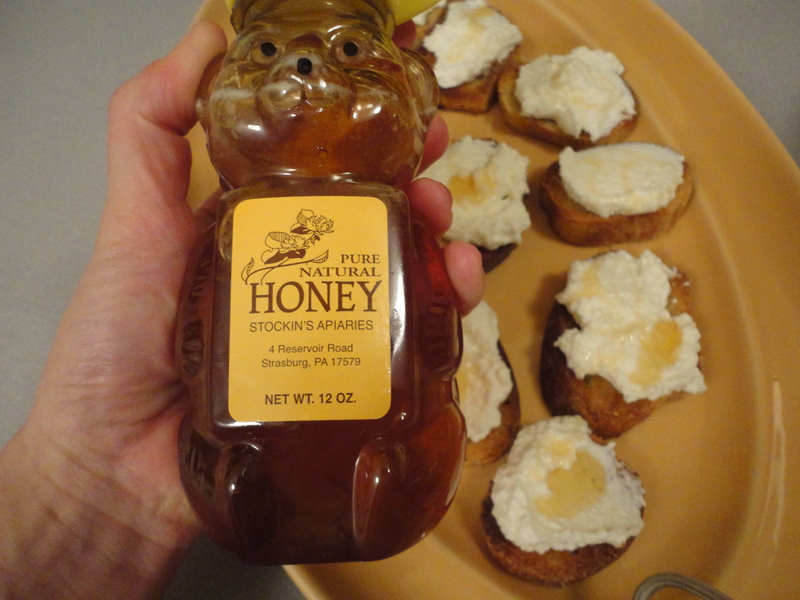 Local Amish Honey – What the WHAT. 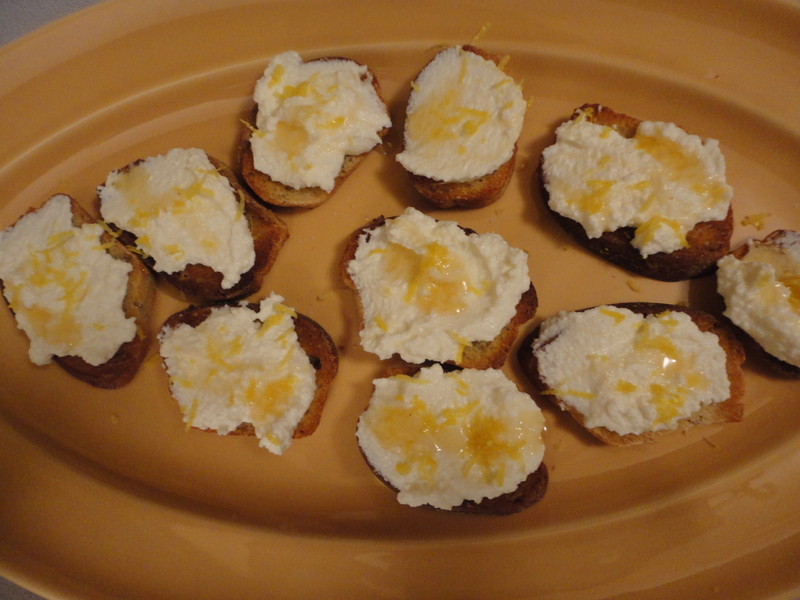 At this point you can either zest the lemon directly onto the ricotta with a microplane or use a cheese grater (like I do) and zest both lemons completely, being careful to leave the white part on the lemon. Sprinkle a generous amount of zest onto each piece. Boom! You’ve got the perfect platter of bruschetta to devour Liz-Lemon-style while watching the Globes. 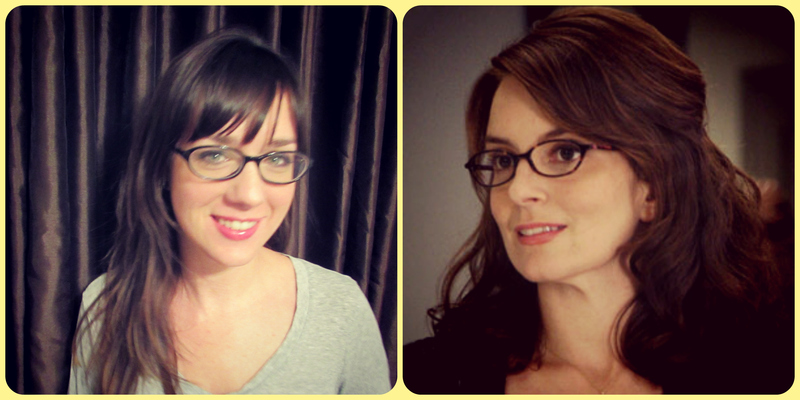 So tell me, what’s your favorite Liz Lemon or Tina Fey moment? Oh this is SO up my alley. 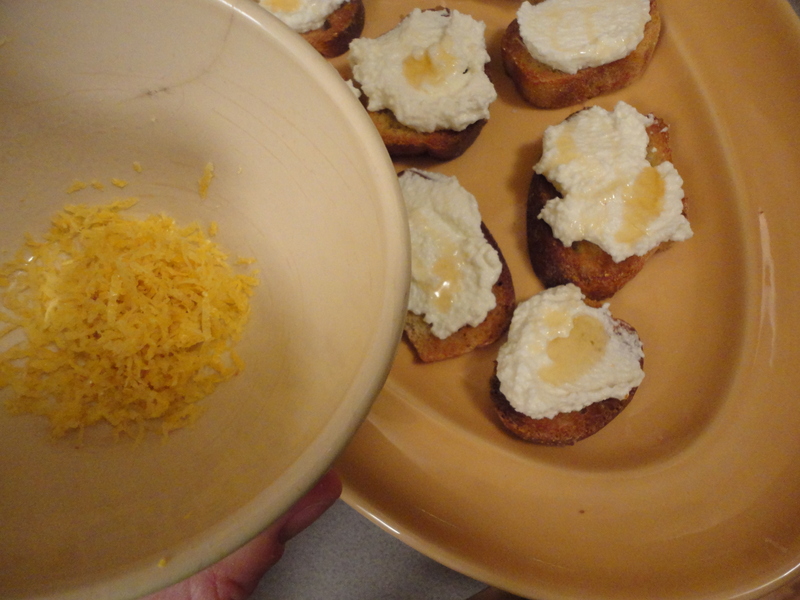 I only just recently discovered the magic of the honey + cheese combo, and it is certainly Tina Fey-level awesome. My favorite Tina Fey moment? “Bossypants.” All of it. P.S. – LOVE the eyewear. just love all of her. And that recipe looks scrumptious! This whole thing is kind of a chick post. I don’t even know who Liz Lemon is, and I’d get my manhood revoked if I ate one of those little poofballs. I think I’ll go sit on the couch with the Mr. and watch football. You are super clever. Great post! Cuteness overload. PS — why are the honey bottles shaped like a bear and not a bee? Never could get all the yummies out of those animal shaped containers, particularly his nose and ears. Good god, I think I’ve just glimpsed a bit of heaven with this recipe. Today I was very close to buying some bread to make you guys bruschetta tomorrow, I swear on my life! Now I will stop and buy these ingredients because even a moron like me can make them, right? And Tina Fey? what is my fave moment? All of them. She’s my idol. DEAR GOD THIS LOOKS SO DELICIOUS. I will be making this in the next couple of days, for sure. My favorite Tina Fey moment is the mozzarella stick line from 30 Rock. I have never felt more understood in my entire life. You’re killing me – the halfway thru a cleanse version of me. Is this where I sheepishly say ice never seen 30 Rock? For me the Tina Fey highlight is her writing Mean Girls. Top 5 fave movie. This looks so easy even I would be able to pull it together. Looks delicious. You are adorable in your Tina Fey glasses. BOOM! Love it. I loved Bossypants but don’t watch TV so have never seen 30 Rock (crawls under a rock…) and these look delightful!! Perfect for this weather in Australia which is not a polar vortex! My favorite Tina Fey/Amy Poehler moment is their friendship. It’s real, honest, relaxed, supportive, motivating, and hasn’t changed one bit despite their successes. I use it as the model for all of my relationships — its amazing to actually see that magical balance where two friends are equally utterly supportive of each other and equally push each other to be better than they ever thought possible. Well good luck hosting the Golden Globes next week.